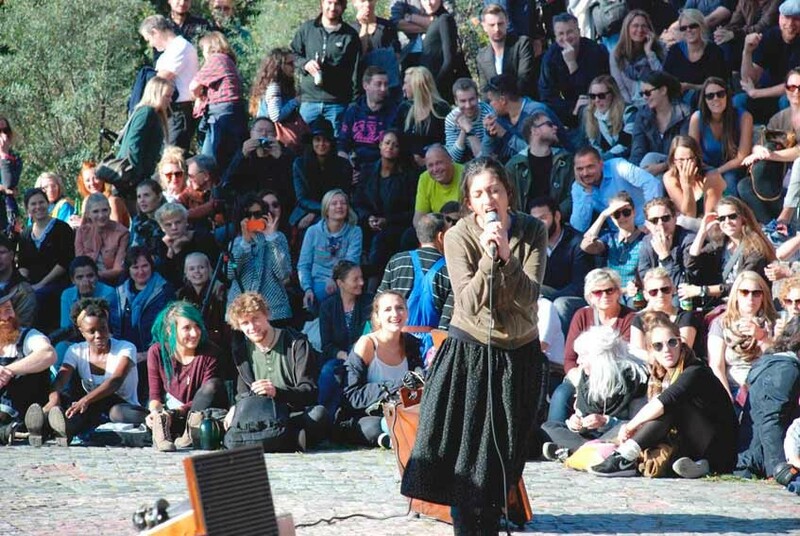 My words, your sounds : MARCELA MORAGA M.
I participate on a public Karaoke at the Mauerpark Berlin. This Karaoke is a kind of ritual for many citizens and a tourist attraction. It takes place every Sunday during Spring and Summer. The participants of this Karaoke imitate famous songs, the majority of the songs are in English, so many of them imitate also a language. The performances of the participants are recorded on cell phones - video cameras and those videos are later uploaded on Youtube. I compose a song with a collection of animal voices, animals that live in and around the city of Berlin and the Brandenburg Region. Later I sing this song at the public Karaoke in Mauerpark Berlin. I took the animal voices from a voice collection of the Museum für Naturkunde Berlin. I documented the performance on HD Video and a Mobile Phone. The mobile phone shooting is available on Youtube, along the other Karaoke participants.